This detailed map is double-sided for maximum coverage and includes both sheets 42.12 and 43.09. (Note that the cover erroneously states 43.10.). Sheet 42.12 covers the coastal area, including Cleveleys Hydro Hotel, Victoria Road, Beach Road, St Andrew's church, Rossall Mount, Rossall Preparatory School. The area around Victoria Road is today's town centre, though here only partly built up; coverage extends south to Anchorsholme Lane. 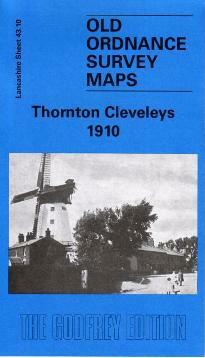 On the reverse adjacent sheet 43.09 is the main map and takes coverage eastward to Thornton. Coverage here includes Cleveleys Park, The Towers, Trunnah, Holmes, Burn Naze (top right corner), Marsh Mill, RC church, St Peter's Mission Church, Christ Church, Poolfoot Farm. These are fascinating maps, especially showing Cleveleys when development into a seaside resort had only just begun. The map links up with sheet 43.05 Rossall to the north and 50.04 Bispham to the south.